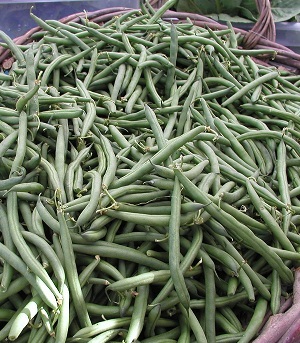 Green beans are available year round, with a peak season of May to October. These beans are also called string beans and snap beans. Today’s green beans have no strings. Please check out What’s Cooking America’s fantastic Green Beans recipes. Wash fresh green beans thoroughly in clear, cool water. Lift beans from the wash water and leave garden debris behind. Rinse again. Break off the end (the top and tail) as you wash them. Leave whole or cut into desired lengths. Beans can be cooked whole, cut crosswise, diagonally or French-cut. If you want sweet tasting, crisp fresh beans, cut them as little as possible. Cut older, more mature beans in the French style. Make sure all the pieces are similar in length so they cook evenly. Boiling, steaming, or microwaving are popular ways to prepare fresh green beans. Stir-frying preserves the best qualities of the fresh green bean. Whatever cooking method you choose, remember to cook fresh green beans as little as possible using the smallest amount of water as possible. The fewer beans in the pan, the quicker they cook and the better they taste. If cooking more than one pound of green beans at a time, use separate pans. Important To Remember: The beans will continue to cook after you remove them from the heat source. Either take them out just before they are cooked the way you like or plunge them in ice water immediately to stop the cooking process. Definition of Blanching: This term means to plunge foods into boiling water for a few seconds or a few minutes, then remove and place in ice water. This process sets the color of vegetables. T he green beans do not cook all the way through, so crisp texture is preserved. How To Blanch Green Beans: In a large saucepan over medium-high heat, bring water to a gentle boil. Add trimmed green beans and cook, uncovered, 4 to 5 minutes or until crisp-tender (you may need to experiment with the degree of doneness you like). Immediately drain the green beans in a colander and plunge them into ice cold water to bring the temperature down. A rule of thumb is the beans should spend as much time in the cold water as in the hot. You can also use a steamer basket. Definition of Steaming: The fresh green beans are cooked by the heat of steam from boiling water. How To Steam Green Beans: To steam green beans, set a steamer basket with the green beans into a saucepan just large enough to hold it tightly covered. Add one-inch of water, bring to the boil, and cover the pan tightly. Regulate heat to moderate. Green beans will take only 3 to 5 minutes. How To Microwave Green Beans: Place prepared bean in a microwave-safe bowl. Add approximately 2 tablespoons water. Cover with plastic wrap, leaving a small corner open. NOTE: If you seal them completely, the plastic wrap will almost shrink-wrap itself to the beans. Microwave on high for approximately 3 to 4 minutes (you might need to experiment to get the beans done to your liking). It is more difficult to get green beans cooked to a precise and even level of doneness when microwaving. Green beans may be cooked several hours in advance. To keep their freshly-cooked taste, once cooked to your liking, dry them thoroughly in clean towels and then refrigerate them in a covered bowl. Will keep for about 4 days, wrapped in plastic bag or wrap, refrigerated. To freeze green beans, wash, and cut ends. Beans can be frozen directly, or blanched for 3 minutes then submerged in ice water before freezing. French cut beans are by cutting the green beans in half lengthwise, running the knife down the flat part between the seams of the bean. If the beans are long, cut them at an angle into lengths of about 2 inches. How do these techniques change for frozen green beans? As you point out, fresh green beans are not available year around, so frozen are used in the winter, and may be used other times for convenience. One of the things I have noticed is that thawed green beans are wet, and need to be dried. Boiling Frozen Green Beans: Frozen green beans need to be cooked through to be edible, but they should not be overcooked. Overcooking robs them of nutrients and can result in a mushy texture. Boiling frozen string beans is a good method, as long as you pay attention to the timing. Place the amount of frozen beans as you want to cook into a colander and run cold water over them. This will not thaw them completely, but it will help. Drain off the water and place the beans in boiling water. Cook the beans for approximately 2 to 3 minutes. NOTE: This is really called blanching. The beans will turn a bright green color in the process. Remove from heat and place in the colander to drain. Their combined heat will help them finish cooking. If you desire your green beans softer, just microwave a little longer. What slow cooking them in a crock pot or over the stove? How long should they cook for? This articles is for tips for cooking perfect green beans. Actual cooking times vary depending on the recipes. We have a link to different green bean recipes at the top of the post. I raised green beans this year. They were supposed to be half runner. I’ve cooked them a few times, different ways, and they are so tough. Why would they be this way? How can I cook them to be tender? My husband said bad seed would cause them to be tough. We raise heirloom half runners. Sounds like you enjoy very soft green beans. Everyone has their own personal preference. All the instructions on the page are provided for tender green bean results. Yes! Best cooked at least one hour with all bean juice, bacon, salt, pepper, garlic, ground basil and oregano. Cook down until small amount of juice remains. Grandkids devour them. I steam green beans 3-4 nights a week, for no more than 10 minutes. Any longer and they are mush! Southern way or grandma’s way, it was cook slow and about 2 or so hours, then add some bacon grease and then cook down, and they fry while you are stirring them. There is not any water to drain/dry etc. I’m right there with you Aunt Mary. I like my green beans COOKED and that takes about an hour or at least 30 minutes if you pressure them. Southern thing I guess, but I want them DONE! I’m from the South and I grew up eating Olive-colored green beans and my wife introduced me to just barely cooked green beans and I love them both but the barely cooked ones actually have nutritional value.